Shalom. I am Rabbi Mark Novak. If you'd like to read a little bit about me, here's my bio. 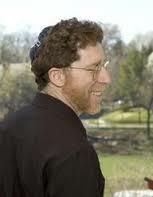 In the spirit of my teacher, Reb Zalman-Schacter-Shalomi tzaddik zt"l, and his students, I am interested in creating and being a member of a community that is both prayerful and playful, and that wrestles in matters of spirit and engages in moments of wonder. I am dedicated to the renewal of Jewish practice through the use of an expanded spiritual tool chest, using chant, meditation, movement, song, prayer, music, improvisation, and storytelling, both personal and traditional. My dream is to co-create, in community, a worship laboratory in which each and every person present purposefully weaves his/her own intention into a shared vision - be it articulated by speech/song/joy/tears/or silence - within the context of the 4-world model that is the siddur, the Jewish prayer book. Think less fixed, and more spontaneous prayer, a place where tradition meets intution. In that spirit, my style of leadership is to create space for others to lead, so that prayer becomes less a passive activity and more a bold experiment in reaching out beyond self. I invite you to join me in this dream. with an eye on the future, basking in the Presence.